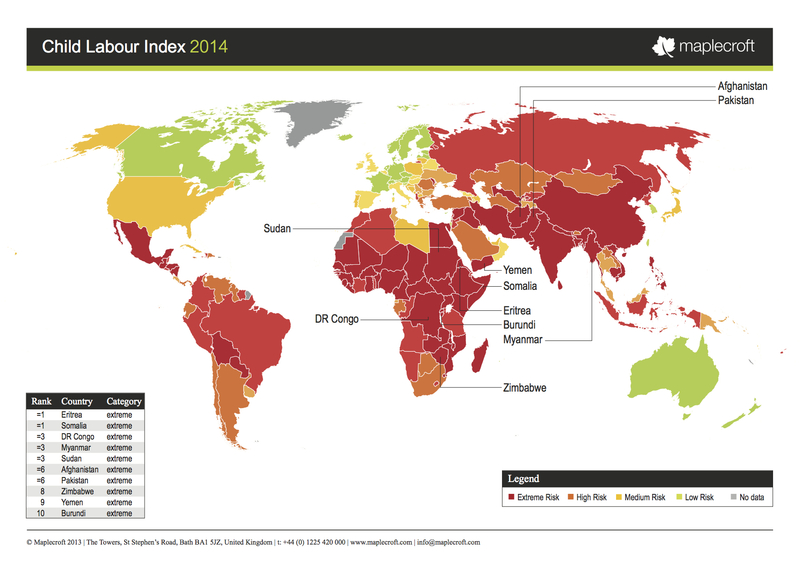 British global risks advisory firm Maplecroft recently released its 2014 index on child labor across the world. For anyone doing business internationally the risk of being associated with child labor is certainly one to be taken into consideration when seeking out business partners abroad, especially in emerging markets. Allegations that a business is benefiting from child labor can damage its reputation, alienate potential investors and customers, lead to consumer boycotts and ultimately hurt profits. The index evaluates 196 countries, of which 12 fare worst in terms of child labor prevalence: India, Bangladesh, Pakistan, Myanmar, Nigeria, Chad, DR Congo, Ethiopia, Liberia, Somalia, Sudan and Zimbabwe. China scored slightly better and ranked 13th. Several of these are large emerging economies that are important for multinational companies as suppliers of raw materials and manufactured goods. There are approximately 168 million child laborers around the world, according to the International Labor Organization. Simona de Logu is an experienced freelance interpreter and translator, specialized in GermanEnglish, but she also works with French, Spanish and Portuguese. You can find her on Google +, Facebook, LinkedIn and Proz.com. Her areas of expertise are economics, finance, business, politics and current affairs due to her previous professional background as a financial journalist. No Replies to "Child Labor Across The World"
SDL Languages © Copyright Simona de Logu 2018. | Privacy & Cookies | Website developed by Websites for Translators.